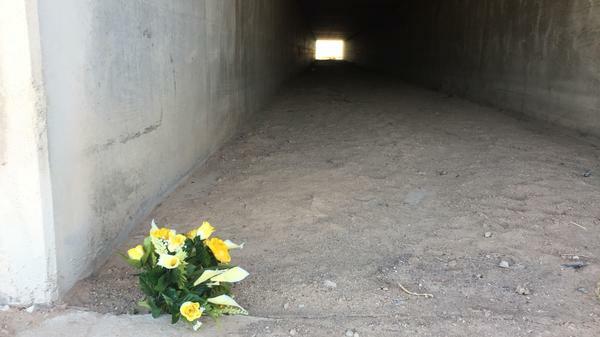 On the night of Nov. 18, Sheriff Oscar Carrillo responded to a report of a Border Patrol agent down in this culvert. 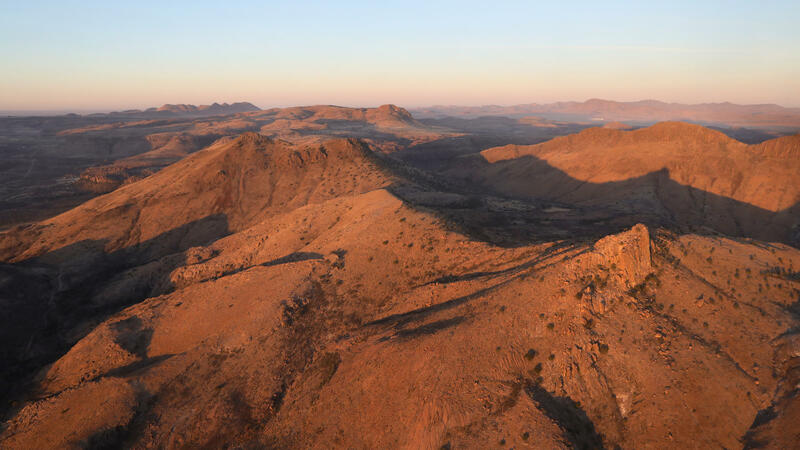 Rugged terrain stretches through the area near Van Horn, Texas. 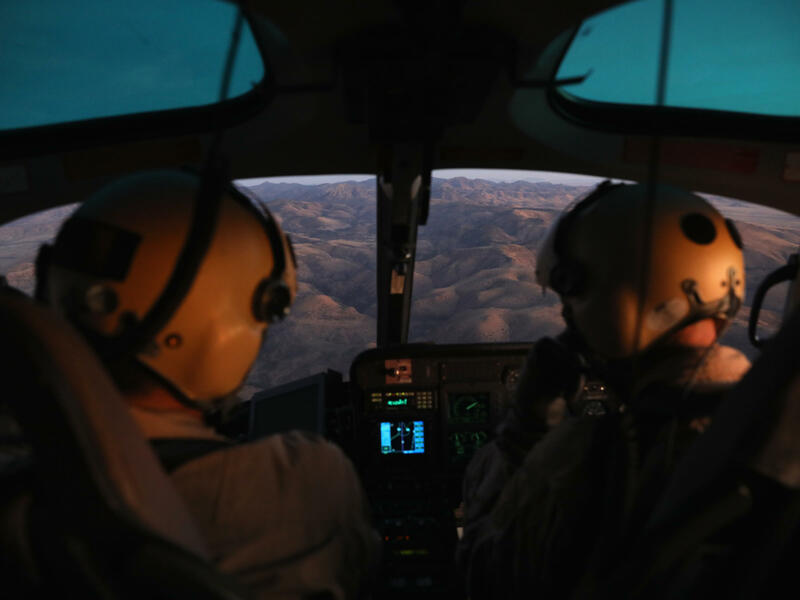 U.S. Customs and Border Protection pilots fly over the Big Bend area of west Texas on November 22, 2017, searching for suspects in the death of U.S. Border Patrol agent Rogelio Martinez. 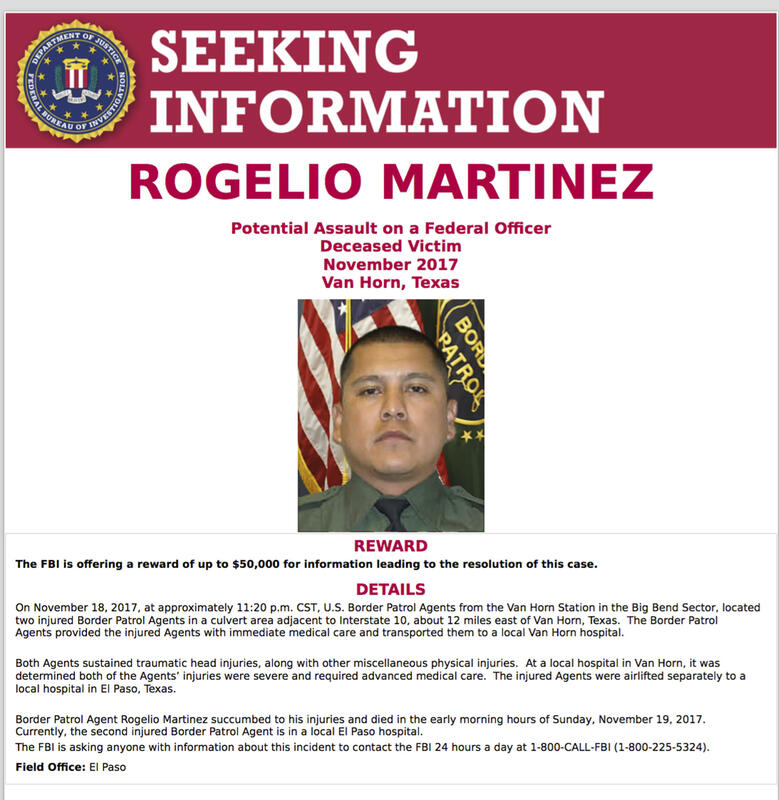 Through signs and billboards, the FBI sought information in the death of U.S. Customs and Border Protection Agent Rogelio Martinez. A bouquet of plastic yellow flowers near the spot where Agent Rogelio Martinez was found. The mysterious death of a Border Patrol agent in West Texas last November led to two opposing theories. President Trump and many Border Patrol agents were convinced that smugglers or illegal border-crossers attacked the agent and his partner with rocks. The local sheriff says from the beginning he knew it was an accident — but nobody wanted to listen. Culberson County, Texas, is a vast badland of thornbrush, mountain, big sky, and tractor-trailers hurtling down a lonely stretch of Interstate 10. The law in Culberson County is Sheriff Oscar Carrillo. On the night of Nov. 18, he was one of the first-responders to a report of a Border Patrol agent down in a culvert — a drainage tunnel that runs under a roadway. "This is the top of the culvert," Carrillo said, in a recent return visit to the site of the agent's death. "Agent Martinez was right there at the base, in the face-up position. And as you can see, it's pretty high." The drop is about 10 feet onto hard ground. The sheriff surmises that Agent Rogelio Martinez and his partner parked on the far side of the interstate to check something out, they ran across the freeway, and right off the top of the culvert. "They just didn't see the drop-off," he said, pointing to the top of the cement tunnel. "You see, no guard railing, no reflectors, it's a dark night." Whether Martinez died accidentally, or whether he surprised a nest of smugglers who bashed in his head is the unsolved mystery. 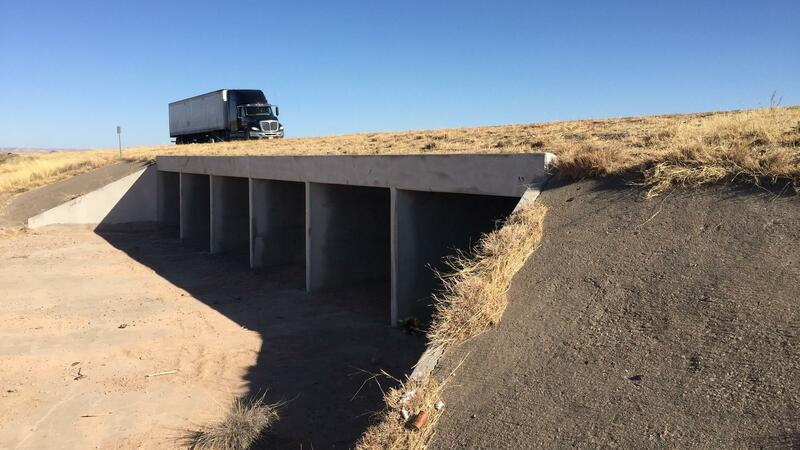 Culverts are notorious for stashing drugs and immigrants. The investigation had scarcely begun when President Trump tweeted, and the Border Patrol union stated, that the agents were attacked possibly by immigrants. The Rio Grande is about 30 miles away. Sheriff Carrillo was the first official to suggest the agent's death was an accident. And he took a lot of flak for it. "We were getting a lot of calls from people from the interior of the United States all being critical of my stance opposing the possibility of an attack," he says. "That's what they were hoping the outcome was — bad hombres coming across the border and assaulting our law enforcement." The case became a flashpoint in the overheated politics of border security. Trump tweeted, "We will, and must, build the Wall!" Texas Sen. Ted Cruz and Gov. Greg Abbott also echoed the theory that border bandits were to blame. "This is a stark reminder of the ongoing threat that an unsecure border poses to the safety of our communities and those charged with defending them," Cruz wrote. When the sheriff posited that the agents were not attacked, critics trolled his Facebook page, to the point where he had to take it down. The Border Patrol union ridiculed him for suggesting the agents could have been sideswiped by an 18-wheeler. Carrillo wants to set the record straight: he says he never seriously considered that as the cause of the accident. "I was referring to the wind gust pushed by an 18-wheeler," he said, "It possibly could have taken them over the edge." The FBI was called in because they investigate all suspected homicides of federal agents. So that's how they treated it. "I'm sure they were under enormous pressure to try to produce something that would fit what the president was saying. But they had to give us that they had nothing," says Liz Rogers, a defense attorney in West Texas for 35 years. Investigators conducted 650 interviews. They mounted horses to look for human tracks. They talked to engineers operating trains on nearby tracks. They reviewed security footage from truck stops. They looked at cellphone pings, and studied license plates of cars on the interstate. Rewards went up on billboards from Texas to California. The other responding agent, Stephen Garland, who's recovering from his injuries to his head and back, is reportedly unable to remember what happened that moonless night. He was only able to radio to a dispatcher that, "We ran into a culvert," according to the FBI. Four months later, federal investigators have no suspects, and no evidence of an assault. "We don't have all the answers yet and we may never have those answers. So it's still a big unknown," said Robert Boatright, chief Border Patrol agent of the Big Bend sector. The investigation remains open. The El Paso medical examiner concluded that Martinez died from blunt injuries to the head, but the manner of death remains, officially, undetermined. Back at the culvert, Sheriff Carrillo stares at a bouquet of plastic yellow flowers that has been placed near the spot where Agent Martinez was found, and ruminates on the most contentious case in his 26 years in law enforcement. "They didn't want the truth," he said. The sheriff points out that all of Martinez's injuries are on the right side of his body — suggesting a fall, not a fight. "If me and you got into a fight, we'd probably have injuries all over. We'd have defensive wounds," he says, "These guys didn't show the signs of an assault." Then he gestures to the sandy landscape. "They were speculating he had been bashed with rocks. If you can see for yourself, there are no rocks." It is true that assaults on border agents jumped nearly 50 percent last year as tensions along the border rose. But it's also true that, in the history of the U.S. Border Patrol, 7 out of 10 deaths on the job have been accidental. 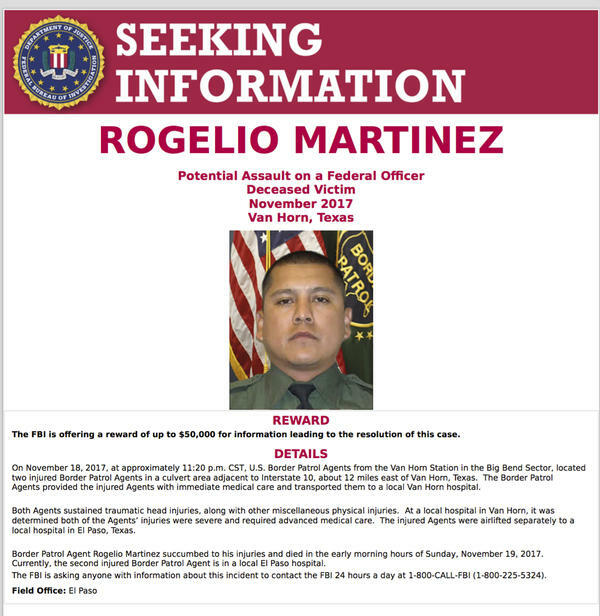 The mysterious death of a Border Patrol agent in West Texas last November led to two opposing theories. Some folks were convinced that smugglers or illegal border crossers attacked the agent with rocks. The local sheriff says he knew it was an accident, but nobody wanted to listen. Now he's speaking out to NPR's John Burnett. JOHN BURNETT, BYLINE: Culberson County, Texas, is a vast badland of thorn brush, mountain, big sky and tractor-trailers hurtling down a lonely stretch of Interstate 10. The law in Culberson County is Sheriff Oscar Carrillo. On the night of November 18, he was one of the first responders to a report of a Border Patrol agent down in a culvert. A culvert is a drainage tunnel that runs under a roadway. The husky lawman, in a cowboy hat, returned to the scene recently. OSCAR CARRILLO: This is the top of the covert. Agent Martinez was right there at the base in a face-up position. And as you can see, it's pretty high. BURNETT: The drop is about 10 feet onto hard ground. The sheriff surmises that Agent Rogelio Martinez and his partner parked on the far side of the freeway to check something out and crossed over on foot right off the top of the culvert. CARRILLO: They just didn't see the drop-off. You see no guardrail and no reflectors. It's a dark night. BURNETT: Whether Martinez died accidentally or whether he surprised the nest of smugglers who bashed in his head is the unsolved mystery. Culverts are notorious for stashing drugs and immigrants. The investigation had scarcely begun when the Border Patrol union and President Trump tweeted that the agents were attacked - possibly by immigrants. The Rio Grande is about 30 miles away. Sheriff Carrillo was the first official to suggest the agent's death was an accident. And he took a lot of flak for it. CARRILLO: We were getting a lot of polls from people, from the interior of United States, all being critical of my stance opposing the possibility of an attack because that's what they were hoping the outcome was. It was bad hombres coming across the border and assaulting our law enforcement. BURNETT: The case became a flashpoint in the overheated politics of border security. Trump tweeted about it saying, we will and must build the wall. When the sheriff said the agents were not attacked, critics trolled his Facebook page to the point where he had to take it down. The Border Patrol union ridiculed him for suggesting the agents could have been sideswiped by an 18-wheeler. Carrillo says he never seriously considered that as a cause of the accident. The FBI was called in because they investigate all suspected homicides of federal agents. So that's how they treated it. Liz Rogers has been a defense attorney in West Texas for 35 years. LIZ ROGERS: I'm sure they were under enormous pressure to try to produce something to fit what the president was saying. But they had to give us that they had nothing. BURNETT: Investigators conducted 650 interviews. They mounted horses to look for human tracks. They reviewed security footage from truck stops. They looked at cellphone pings and studied license plates of cars on the interstate. Rewards went up on billboards from Texas to California. And they got nowhere. The other responding agent Stephen Garland, who's recovering from injuries to his head and back, is reportedly unable to remember what happened that moonless night. He was only able to radio to a dispatcher that, we ran into a culvert. Four months later, federal investigators have no suspects and no evidence of an assault. ROBERT BOATRIGHT: We don't have all the answers yet, and we may never have those answers. So it's still a big unknown. BURNETT: Robert Boatright is chief patrol agent in the region. The agents' union remains convinced it was murder. A union official, not authorized to speak publicly on the matter, noted the agents were hurt while investigating possible smuggling activity. He says the agents knew where the culvert was, and it's ludicrous to think they just ran off the edge. The investigation remains open. A medical examiner concluded Martinez died from blunt injuries to the head but left the manner of death undetermined. Back at the culvert, Sheriff Carrillo stares at a bouquet of plastic yellow flowers that's been placed near the spot where Agent Martinez was found. And he ruminates on the most contentious case in his 26 years in law enforcement. CARRILLO: They didn't want the truth. The truth is hard to sell. BURNETT: The sheriff points out that all of Martinez's injuries are on one side of his body - suggesting a fall not a fight. Then he gestures to the sandy landscape. CARRILLO: You know, they were speculating he had been bashed with rocks. If you can see for yourself, there are no rocks. BURNETT: It is true that assaults on border agents jumped nearly 50 percent last year as tensions along the border rose. It's also true that 7 out of 10 deaths on the job in the Border Patrol are accidental. John Burnett, NPR News, Van Horn, Texas.